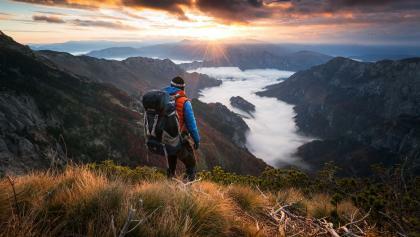 This is an epic hike over one of the most attractive mountains in Bosnia and Herzegovina. Prenj is an adventure including ascents to high peaks and amazing karst scenery. This trail crosses Prenj from West to South. This trail crosses Prenj from West to South. From the city of Jablanica, pass over local hills to the village of Ravna and follow the trail ending on an exposed ridge with great views on Cetina rock face – more than 1000 m high. It continues to a green mountain pass Medjuprenje where there are two mountain huts (one is always open). It continues towards Lucine valley, but turns East over Zakantar, a huge karst plateau and a natural habitat of the endemic Prenj salamander (seen only during the night and rainy weather). Zakantar will end below the amazing Tisovica valley which ends on the slopes of Prenj's highest peaks – Zelena Glava. Half an hour from Tisovica there is another mountain hut called Vrutak. The trail leads across Zelena Glava ( 2155m) and Otis summit ( 2093m), and continues to another valley and further to Bijele Vode ( White waters) where you will find another mountain hut and an old shepherd hut (Katun) which serves as a shelter. From BIjele Vode, the trail descends down towards Ruiste settlement and recreation area. Ruiste is a popular destination for Mostar citizens. There you will find two other mountain lodges, a hotel and a small ski center. From here you can get a lift to Mostar, call a taxi or continue towards Boracko lake. Contact local guides for a great experience. There are many places along the trail worth seeing. Some areas of Prenj are still suspected of landmines. This trail is safe; however, it crosses one suspected area of 500 m in length after leaving the road (over the meadow). The trail (and around it) is clear and safe, but you should not wonder around behind the marking signs. If you don't feel comfortable with this, stay on the road until you join the trail again. Also there are a couple of other places (Zakantar spring and close by Vrutak hut) where landmines are suspected, but the area is cearly marked. Just respect these signs! Watch for snakes and mind your steps because the terrain is very rocky. Waether on Prenj is quite unpredictable. It is not uncommon that it snows during the summer and the temperature drops below zero. 121 - Call for Rescue. Also note that part of the mountain are not covered with mobile phone signal. Good boots are a must. Protect yourself from the sun. Though many people drink regularly from the Prenj springs, the usage of water filters on small springs is recommended. Cross the road in Ravna and look for the trail signs leading up to the woods. 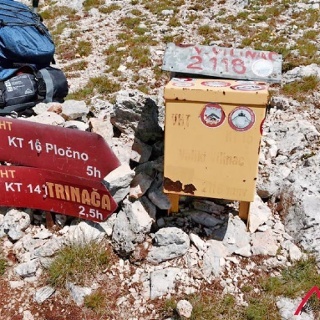 After joining the trail going to Cetina from Medjuprenje, turn left to take a break at the huts or continue towards Cetina and Greda to the left. On Greda (pass) go right. You'll find a spring at the bottom of the scree slope to the right beneath a rock when descending down towards Lucine. Past the newly built shelter in Lucine, turn left (east). At the next crossing towards Lupoglav summit, you remain on the trail (left, straight). Before the main crossing in Tisovica (you can see signage pole from distance) you'll join a trail going towards Vrutak, so go right there. The trail climbs up to Podotis and close to its highest point there is a crossing where you should go right. The trail to Zelena Glava and Otis will climb to the right and return the same way. If you don't want to climb Zelena Glava, continue straight (south). Keep straight all the way to Bijele Vode and beyond. After a couple kilometers on the old truck road in the woods you can turn to the left over a small meadow, but you can remain on the road as well as it will lead you to the same point. At the ruin look for trail blazings again, and follow it all the way to Ruiste. When you reach the main road again go left. Several bus lines go through Jablanica to Mostar and Sarajevo direction. From the centre of Jablanica walk over the bridge and through the tunnel. The trail starts on the left side after the small bridge. At the trailhead or in Jablanica city. Tried to do it the other way around but failed in the middle. Started in Rujiste (took a taxi from Mostar for 50 Mark for two persons, you should only pay 30 though!) and slept one night in the mountain lodge. Call in advance, they provide food as well. In Rujiste the house keepers were very friendly and helped us a lot with informations or calls. They have a key for the hut 'Adnan Krilic'. Slept one night there. There is leftover food and gas to cook when we were there. Beds are good and there are many blankets. No electricity and tap water anymore. Rain water is next to the house and a spring 10 minute walk further the official path (after you pass the shelter on the left hand side). Didn't find the well closer to the hut. The shelter looked okay as well. Has even a small fireplace. We continued the next day to Mountain Hut Jezerce. The top Jelena Glava is worth it, but only if the weather is nice. Jezerce is a lovely place to stay and open all year round. The next day of our destination was Milanova Koliba (open all year round). The hut right next to it (Meduprenje) is closed if you don't call in advance. There is apparently a key in Konjic you can borrow. Walked down to Vrutak Hut (is mostly closed, key is in Konjic as well). Further down the gps is wrong, just stay on the marked path, because if not you walk straight through mine suspected area. The map of the book 'Via Dinarica' from Tim Clancy has the same failure and leads through the dangerous area. 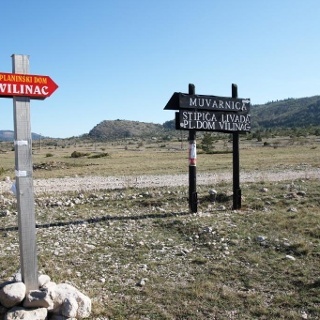 If you reach a plateau (Tisovica) there are two big sign poles. The one closer to Vrutak is a Via Dinarica and the other one is an older one. Didn't realise that the Via Dinarica don't show in which direction you have to walk, but in which direction the destination lies. Just go straight to the older sign pole (which is the opposite direction of what the Via Dinarica sign shows) and then head left. Be aware that this path is not even on the map as a dashed line). We lost too much time in searching the path because of the wrong GPS and coupled with bad weather we decided to go back to Jezerce and then the next day back to Rujiste. You have rarely phone signal on Prenj, so plan all huts in advance. Would recommend to sleep in huts. Walked in the beginning of september and it was quite freezing at night. Even in huts you should have some good sleeping material, that you don't get cold.